Our meals are created to a high standard. We take great pride in serving delicious food and we’re not happy unless you are. We serve a range of alcohol and soft drinks including wine, beer and real ales. Just want coffee? We’ve got you covered. Our rooms are decorated to a high standard. All the rooms are ensuite, have under-floor heating, complementary tea and coffee-making facilities and digital Flat-Screen TV. We have regular events including live music and karaoke nights. Check here for details. 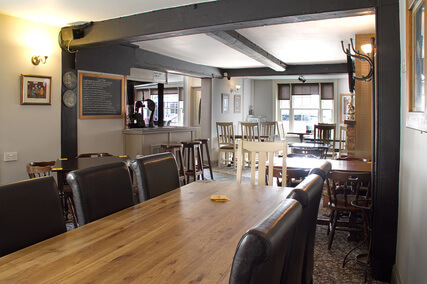 The Horse and Groom is a centuries-old Coaching Inn conveniently located in the heart of Holbeach town near Spalding. We are well placed to offer freshly cooked food, drink and comfortable en suite accommodation to people passing through, or stopping in the area. Our rooms are located in a converted stable to the rear of the pub, and cost from £58.00 per room, per night (including VAT). The rooms also benefit from a private parking space. The pub and the rooms are all Wi-Fi enabled. Each of our 3 double rooms have under floor heating, flat screen digital TV, hairdryer, and complimentary tea and coffee making facilities. Should you require breakfast, there is a small additional charge, and it should be arranged the night before. All of our rooms are non-smoking. Within half a mile of the A17 at Holbeach and about 8 miles from Spalding, we are well placed to offer food and accommodation to people passing through to areas such as the Norfolk Broads and Lincoln. In fact Holbeach is a good place to base yourself for a holiday, being centrally located between Norfolk, Cambridgeshire, Peterborough and North Lincolnshire for the Wolds and the historic city of Lincoln. To Nick & Tracy, Thank you both very much for a lovely break. Hope to see you both in the near future. Very warm welcome, room fantastic. Will stay again. Your friendliness and hospitality made for a very pleasant stay. Facilities – lovely fresh and modern. Very clean, lovely room, top food and very warm welcome for our son too!! Cracking room, comfy bed, very friendly staff. Perfect, super breakfast.